You have decided to go to Windham, NY for your summer vacation. Smart choice! However, now you need figure out where to stay and what you want to do. At Albergo Allegria, we are located in the gorgeous Catskill Mountains. Our Bed & Breakfast offers excellent hospitality and modern amenities in a setting filled with character and history. Ranked as #2 of 80 Hotels in the Catskill Region we pride ourselves on making sure your stay is perfect. The answer to what is there to do in Windham, NY is too much! There is adventure around every corner and a new view to take in. 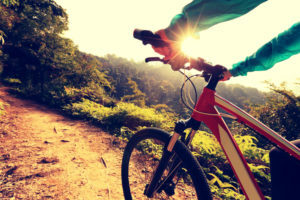 Some of our favorite activities in summer are biking and hiking! With biking or hiking, it gives you the opportunity to see everything and anything. The Catskills Mountains contain so many unique and hidden views that you have to go off the beaten path and explore! Windham Mountain Bike Park offers a unique downhill experience and the longest jump trail on the East Coast. Miles of trails and a world class host to five UCI Mountain Bike World Cup is serviced by a high-speed quad lift. You will never pedal uphill! World renowned trail designers have created an outstanding Catskills Mountain terrain. Giving riders of all levels something to cheer about. Never tried downhill riding? No Problem! First timers and new riders are welcome at our new Skills Park including tabletops, mini rock garden, and more. The Skills Park offers a ton of adventure to keep you there all day! The five restored fire towers of the Catskill Park offer you the ability to view the Catskills from a 360-degree view. Not every Fire Tower walk is easy, so be sure to download the trail map and guide before you go! Another amazing hike to take is to the Kaaterskill Falls. It is the highest cascading waterfall in NYS and one of America’s oldest tourist attractions; it appears in many of the most prominent books, essays, poems and paintings of the early 19th century! Take a look at all of the maps to find what hiking adventure is right for you! Look for challenging climbs or pleasant strolls! Now that you have an idea or what to do in Windham, NY you need to figure out where to stay, and we have the perfect place! At Albergo Allegria Bed & Breakfast, whether you are a veteran inn-goer or new to the Bed and Breakfast experience, you are sure to have the perfect stay. Unlike many lodgings, we offer a ton of extras! Enjoy the guest pantry with complimentary soft drinks, hot beverages, homemade cookies, cold spring water, guest fridge, and freezer. After a day of exploring cozy up in the lounge by the fireplace with a book or verse some people in board games. Also, let’s not forget about the are world renowned Breakfast! Fresh and creative, you will want more. Fresh fruit, steaming hot muffins, signature granola, yogurt, and toasting breads are just a prelude to the entrees to come. If the breakfast has not sold you, we do not know what will. At Albergo Allegria, we want to make sure your trip to Windham, NY is perfect. From tips on sightseeing to local stores we are here to contribute to making your stay one to remember. The town by itself is extraordinary and filled with so many things to do. Now that you know what to do and where to stay don’t hesitate and call us today and book your Catskills Mountain vacation!